A nice little hotel on the edge of the Black Forest. We stayed here during Advent; it was only 2km from the Gengenbach Adventmarkt which is worth the visit! I would like to visit during the summer. The owner speaks English. We stayed here while visiting the Black Forest region and it was so nice to come back in the evening and sit in the garten. Our family of five and our dog stayed here and felt very welcomed by the staff and the other guests. The staff is wonderfully helpful and so nice! Breakfast included a lot of choices. Dinner was absolutely wonderful! If our travels take us back to the area, we would definitely stay here again! Lovely room,excellent food and very welcoming staff.An ideal base for visiting the Kinzig valley villages and ideal for the Christmas Fair in Gengenbach,our favourite visit.Freiburg is a shortish journey by car and well worth a visit for Christmas activities. The location is great, the rooms are clean, nice breakfast and a friendly cat. The bedrooms & bathroom were of a good size. The breakfasts & restaurants were good. Nice and clean and comfortable hotel. Clean room and bedding. Nice balcony. Friendly owner, great breakfast. Sleeping: Very good. The hotel is located at the main road in the village, but still very quite. Friendly staff and clean rooms. Nice beergarden at the back. Breakfast is ok, too. The quality of the kitchen in the evening was rather poor. I decided to eat at the Greek restaurant just 100m away the other nights. They have an excellent kitchen. Parking space cost 5 Euro/night - no info about that when you arrive, but you can read it in the invoice after one week. Ok, 5 Euro is not that much, but I expect to get that info when I arrive. Otherwise I maybe would have parked at the mainroad. 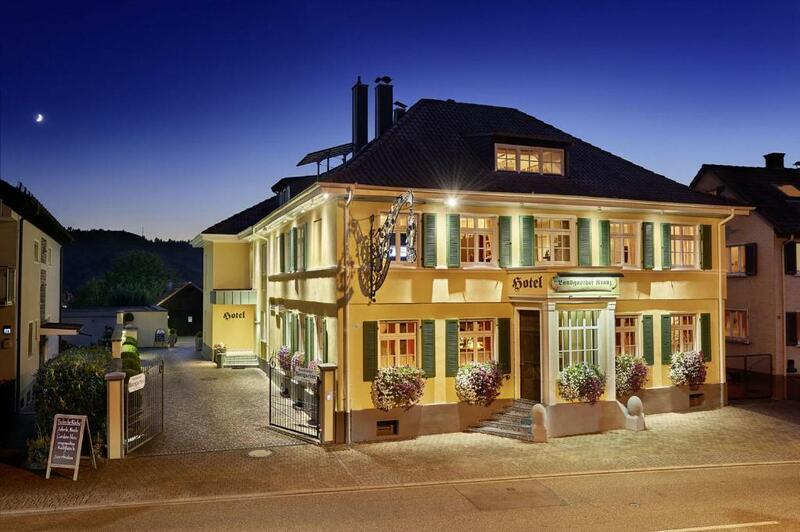 Overall it´s a totally ok to stay here and I would recommend this hotel to everyone staying nearby Offenburg. The hostess was always willing to assist and made our stay comfortable. The hotel is nice and the photos are exact. Good location for somebody who wants to visit Alcase and Black Forest. Landgasthof Kranz This rating is a reflection of how the property compares to the industry standard when it comes to price, facilities and services available. It's based on a self-evaluation by the property. Use this rating to help choose your stay! This historic, 3-star hotel in Ohlsbach is just 4 miles from Offenburg in the northern Black Forest. It offers individually furnished rooms, free Wi-Fi and a traditional restaurant. 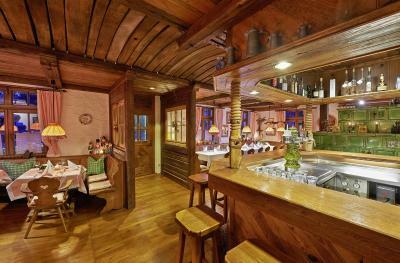 Dating from 1864, the Landgasthof Kranz offers rooms decorated in a bright, country style. Some rooms feature air-conditioning, a balcony and a flat-screen TV. A rich breakfast buffet is served each morning. A range of local and international cuisine is available for lunch and dinner. The quiet beer garden features a wooden cabin with a bar and sitting area. Strasbourg is just a 30-minute drive away. The Kranz provides free parking. When would you like to stay at Landgasthof Kranz? These rooms include a flat-screen TV with free Sky satellite channels. House Rules Landgasthof Kranz takes special requests – add in the next step! Landgasthof Kranz accepts these cards and reserves the right to temporarily hold an amount prior to arrival. If arriving outwith check-in time, please contact the property in advance to arrange key pick-up. Contact details can be found on your confirmation. Please inform Landgasthof Kranz of your expected arrival time in advance. You can use the Special Requests box when booking, or contact the property directly using the contact details in your confirmation. Dog friendly. Comfortable beds. Friendly staff. Nothing! !We had a lovely stay and the hotel would be equally suitable for a Summer holiday. I feel as though the property was a little too far from Europa Park. We had thought upon booking that it was closer but ended up being a half an hour drive. That has more to do with our preferences than the hotel though. The hotel is very clean and the owner takes great pride in making sure everything looks nice. The breakfast was very nicely displayed and the room was very nice. This is now the third time we stayed here, the first two stays were great, yet this time we were very disappointed. When we arrived, despite having been there twice before, we were greeted with "Hello, I'll show you to your room, but first I have to go to the toilet". It would have been nice to hear a "welcome back" We booked an "executive Double room" because whilst booking, it said it had Air conditioning, the owner admitted that she didn't bother looking at the reservation closely, not to mention, she decided that this time of year people want heating, not air conditioning. We were told to call her directly next time so she can make sure we get what we book. On the booking page, the only difference I can see in the description of the "executive double room" and the "standard double room" is the addition of air conditioning; We didn't get this, yet we still paid the "executive" rate. The booking page states "The Kranz offer free parking. We paid 4 Euro/day. There was no internet in our room for the entire 3 days. We mentioned this and she admitted that there have been problems, but she would call the phone company again. The next day she said she needs a new wifi range extender which she would get later in the day. By that evening there was still no internet in the room. My husband needed to do some work, to which we were told he can come sit in the reception area where the signal was stronger. At this point we had no other choice but to buy a SIM with a data package. The next morning at Breakfast, another family was also complaining about the lack of internet in their room. The owner's response? "I've done all I can, anyway, I have checked outside your room you have 2 bars" Well inside the room we have 0 bars! When we went to check out, I listed all the issues we had, yet she accepted no responsibility, and was in fact quite rude. not even an apology. Paying for on-site parking was not expected. Check in time stated as 1600-2300, Doors were not unlocked until 1700 hrs. Location not ideal with children. Room decoration really old-fashioned. Loads of clutter everywhere like weird mannequins and 'tradiotional' paraphernalia. No staff hence slow service. Have to pay for parking despite over the odds room charges. Small frosted glass window only in room and metal 'ferry like' door on room. Breakfast was lovely. Very fresh and delicious. That the reception was closed when we arrived. Appartments are next to church. You get bell sound at 6am and then every 15 mins. Nice lady owner. Breakfast not too bad. Probably a very small thing but breakfast was only until 9 30.. an extra 30 mins or hour would have been nice (when travelling with little ones) but nevertheless, not a problem if you rise early! The owner is really friendly and helpful.